I guess we must be the only forum, with a games section, that has no mention of the Call Of Duty series. Well, there's no escape. I just completed Modern Warfare 3, and I feel a need to share this awesomeness in a place where awesomeness is appreciated. 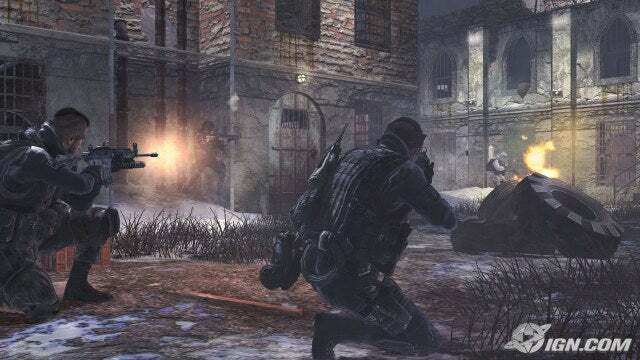 Modern Warfare is a Spin-Off of the World War II-themed FPS series Call of Duty. The setting is best described as an Alternate History, with the divergence point lying somewhere before the Chernobyl disaster, when powerful Russian leader Imran Zakhaev started a massive Ultranationalist movement in Russia. Said movement eventually initiated a civil war against the Loyalist pro-Western faction of Russia, which serves as the backdrop in the first game and the catalyst of the Middle Eastern rebellion, another of the original's plot lines. The second game, set five years later, sees what happens to a new Cold War between the US and an Ultranationalist Russia when a covert op to unmask a wanted terrorist goes horribly wrong. The third one follows the happenings of said war and the desperate hunt for the man that caused all of this. Now, USUALLY, I'm not a big fan of FPSes, I find them repetitive and un-imaginative. At first glance, COD seems to be crap as well. I mean, Russia as an enemy? It's like America never got over it's Cold War paranoia. But the difference in this series is that they make things CINEMATIC. It isn't just the repetitive gunning down of eleventy billion faceless enemies, it's like being in a War movie and seeing things from the main characters perspective. In other words, as a player you are actually interested in what happens to your fellow soldiers. The main story is propelled forward by 2 awesome characters, Captain Price and Cpl. John 'Soap' Mc Tavish, from the SAS. In the course of the games you switch POV to many different characters. Who sometimes die. Yeah, thats right, sometimes you die. Thats not something thats done too often in other games. Of course, that takes out some of the realism from the whole thing. But who needs realism when you can be zipping past Russian tanks on a Snowmobile? COD seems to Glorify Warfare. But at the same time, there are bits that show how Brutal and needlessly violent war can be. Then you'll probably be into this. P.S> Don't try multiplayer unless you want 14 year old boys swearing at you all the time.